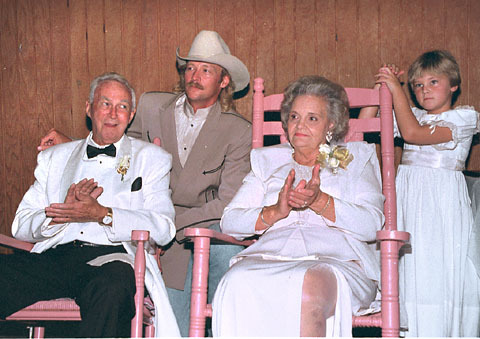 Eugene Jackson, the father of country music singer Alan Jackson, died Monday at Newnan Hospital. Jackson, 72, was retired from Ford Motor Company. He also worked for Coweta County for many years. He was a member of First Baptist Church of Newnan. The Coweta County Commissioners paid tribute briefly to Jackson at their meeting Tuesday. Chairman Vernon "Mutt" Hunter recalled Jackson's service as a county employee and mentioned that he was the father of former County Commissioner Diane Dawson. In addition to Dawson and Alan Jackson, Eugene and Ruth Jackson have three other children -- Connie Davis, a former Coweta County educator who now is a principal in Dahlonega; Cathy Wright, director of the Georgia Youth Science and Technology Center at Shenandoah; and Carol Frank, consultant with the Coweta County School System's special education office. Eugene Jackson and Ruth Musick were married Aug. 17, 1946 after he had served in the U. S. Navy during World War II. The Jacksons celebrated their 50th wedding anniversary with a family celebration at Newnan Country Club in 1996. Services will be held today at 2 p.m. in the chapel of McKoon Funeral Home. Burial will follow at Oak Hill Cemetery. Memorial contributions may be made to NCARC-Rutledge Center, 61 Hospital Rd., Newnan 30263 or American Cancer Society, 27 Clark St., Newnan, GA 30263.